You heard that right. I’m not kidding. 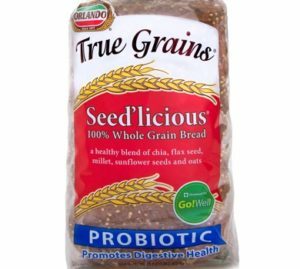 I ate probiotic bread was bursting with benefits – True Grains® Seed’licious, Purple Wheat Raisin and Honey Wheat. 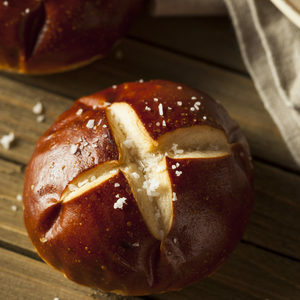 How can bread have probiotic benefits if all the good bacteria are killed in the baking process? 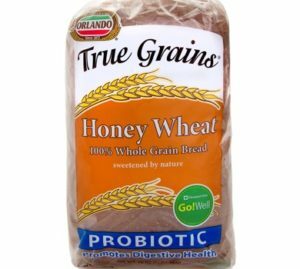 Well, the True Grains® line of product from Orlando Baking Co. uses a patented strain of probiotics that are resistant to high heat in the baking process. And no, it’s not GMO either. 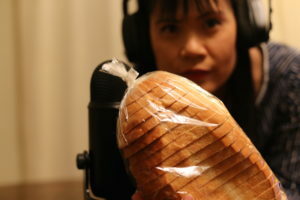 How do we know that the probiotics are working in the bread? Meredith answers this tough question here. 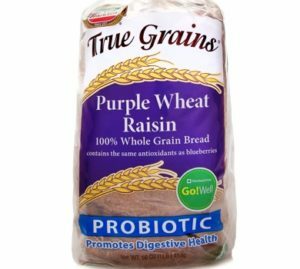 True Grains® Purple Wheat Raisin, made with Purple Wheat that’s high in antioxidants and stops your glycemic index from spiking, was my favorite. If by now you haven’t figured out my weakness for fruity bread, you haven’t been following me very well. I really enjoy eating something so special and nutritious, and I’m very happy to see this particular innovation from Orlando Baking Co. 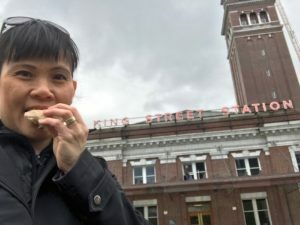 The popularity of baked goods makes them the perfect vehicle to deliver probiotics to consumers. However, there are some challenges. During the baking process changes in pH, activity in water, ethanol production, Maillard reaction products and high temperatures are a challenge to the survival of probiotics. Microencapsulation is the only way to overcome this and produce probiotic bread. It is a coating technology that protects sensitive compounds or living cells during the entire food processing operation, including storage. One study looked at application of encapsulated L. acidophilus on the surface of par baked bread loaves. It was found that the shorter baking time and temperatures used for par baked bread allowed greater survival of L. acidophilus while maintaining the desirable sensory characteristics of the baked bread. Bread has the potential to provide both prebiotic and probiotic benefits. Once again proving that bread is the ultimate functional food! Hibberd, P. L., Phd, Linda Duffy, Phd, and David Shurtlef, Phd. “Probiotics: In Depth.” National Center for Complementary and Integrative Health. U.S. Department of Health and Human Services, 16 Jan. 2017. https://nccih.nih.gov/health/probiotics/introduction.htm#hed3. Accessed 19 June 2017. Centuries ago, eating white bread meant you had status. White bread was served to the elite classes while the peasants continued to suffer with crusty whole grain loaves. How the times have changed! I know everyone loves to hate white bread these days. It seems to embody the distrust consumers have of industrially manufactured foods. But are artisan breads like sourdough healthier than white bread? The use of bleached flour and the addition of dough conditioners, emulsifiers, and mold inhibitors are seen as unhealthy and blamed for our modern health issues. As consumer preferences have begun to shift to more wholesome ingredients, artisan bread began gaining in popularity. But what exactly is artisan bread and is it any healthier than industrially produced white bread? Artisan bread is loosely defined as bread that is produced using traditional methods and ingredients. Choice of flour type, length of fermentation, and how the bread is made are important characteristics for an artisan loaf. Dough is generally made in small batches with a more hands on approach. With the rise in popularity, the manufacturing of artisan loaves has been scaled up to embrace some modern conveniences. 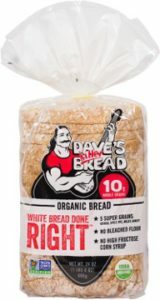 Due to the minimally processed and clean ingredient declaration consumers believe this to be a healthier bread. A recent study tried to answer the question – Is artisan bread healthier than manufactured white bread? 20 healthy adults participated in a randomized crossover trial of two 1-week-long sessions. 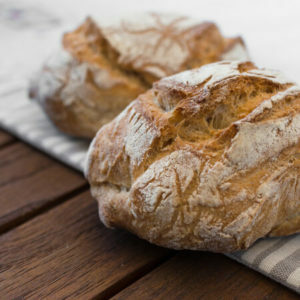 Participants consumed traditionally made sourdough-leavened whole-grain bread or industrially made white bread widely available for the study. Test subjects ate standardized meals calculated to have 50 g of available carbohydrates. During the white bread intervention period, subjects consumed 3 meals of 110 grams white bread, and 3 meals of 113g white bread + 30g butter. Sourdough meals consisted of 3 meals of 145 g sourdough bread, and 3 meals of 149 sourdough bread + 30 g butter. The test showed no significant difference between consumption of traditionally made sourdough-leavened whole-grain bread or industrially made white bread on the participants. The study does point out that both types of bread had had very personal results on participants. What are you telling me? Is there really no difference between sourdough bread and white bread nutritionally? While one person might have a blood spike after eating white bread another may person experience the same thing eating artisan sourdough. Another measure that was dependent on individual participants was gut biome. 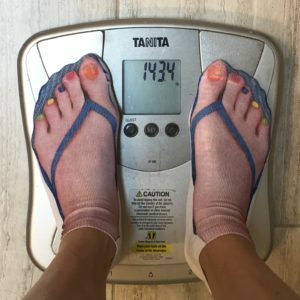 The researchers found that the microbiota composition remained generally stable and person-specific throughout the trial. So there you have it! There’s no nutritional difference between sourdough and white bread. This week’s white bread of choice? Dave’s Killer Bread White Bread Done Right. 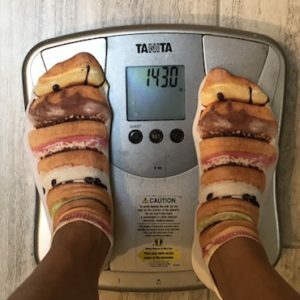 Mind you, their white bread has 10g of whole grains! 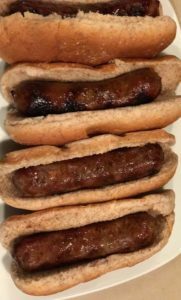 Bratwursts off the grill. Yum! If there’s one thing I love more than bread, it’s a good bread origin story. Knowing the backstory and passion behind the loaves and baker really does make you appreciate the bread all the more. Bob’s Red Mill traditional and dedicated take on flour has been a long time in the making. Back in the 1960s, Bob Moore read a book about an old stone-grinding flour mill. The book sparked an idea to use this old-time practice to create a healthy and nutritious product. 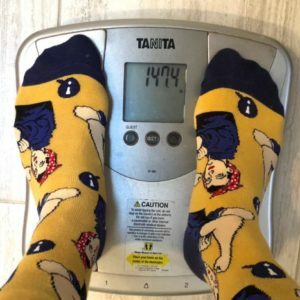 His family was already focused on eating wholesome natural foods. So why not share that with families everywhere? So Bob and his wife Charlee started tracking down their own millstones and soon opened a mill in Redding, California. By the late ’70s, the couple were ready for retirement, so they left sunny Cal for Oregon City. But Bob couldn’t move on from milling just yet. He found an old mill for sale, and soon Bob’s Red Mill reopened in Oregon. A few years later, tragedy struck. An arsonist started a fire that destroyed the mill. Still, Bob preserved and built his stone-grinding flour mill from the ground up once again. It is still grinding out flour today, stronger than ever! Through the years, the company has stayed true to Bob’s original vision of using Old World technology to make a nutritional, healthy flour. The quartz millstones are similar to early Roman mills. The speed and temperature help preserve the goodness inside whole grains, resulting in a flour that you can just taste the freshness! I love stories like these. As I munch on their 10 grain bread, I feel honored to be in Oregon and eating bread from Bob’s Red Mill. Hearty stoneground 10 grain bread.